Not to be confused with the vanilla TIME CHASERS (1994, featuring that cleft-chinned Canadian anti-leading man), THE TIME TRAVELERS is one of those classic 1960’s thought experiments where scientists accidentally trap themselves in a bleak, blasted future society of 2071 – a “future” which is closer to our present, so which seems pretty silly now, but which, metaphorically, they didn’t get far wrong. Writers Ib Melchior and David L. Hewitt plagiarize freely from H.G. Wells’s The Time Machine, if not from WORLD WITHOUT END (1956), which is also plagiarized from Wells’s story. Once again in allegorical fiction, we meet H.G. Wells’s Eloi and Morlocks, with different names, but the same characteristics – the belligerent Mutants (read as Morlocks) now live above ground, on the irradiated surface of Earth, and the Resourceful Humans (read as Eloi) live below ground in a thriving society, in constant vigilance against the Mutants breaching their caves. Melchior (who wrote REPTILICUS) directs, and keeps it mechanical and efficient, where all characters seem to inhabit a block of space that they must never move out of, at least, not while an “explanation” scene is in progress. Three scientists and one doofus find that their time machine viewscreen is also a portal! They step through and the portal collapses. Nice going, sci-doofuses! 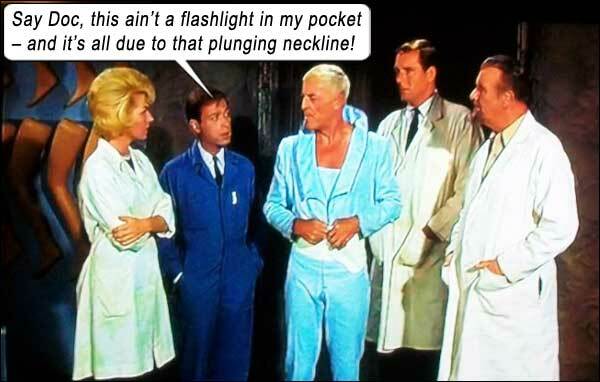 There’s the old senior scientist, who has to have a German-sounding name, Dr. Erik von Steiner (Preston Foster), the strapping young scientist who must suffice for Chuck Heston, Steve Connors (Philip Carey), the blond scientist for looking worried and screaming, Carol (Merry Anders) and the Shaggy of the bunch, whose patented method of repelling Mutants is to throw small rocks at them, Danny (Steve Franken). 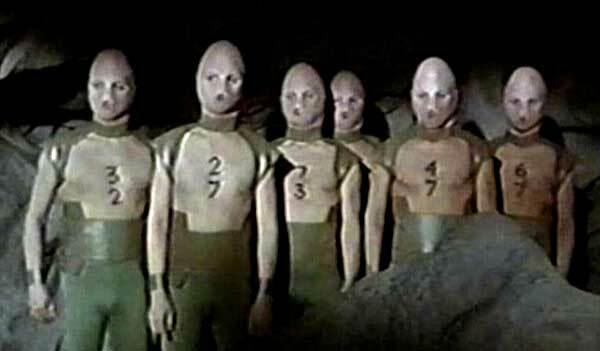 They are rescued from Mutants by the underground society of humans who wear form-fitting outfits with plunging necklines (especially on the men) and no visible pantylines (especially on the men). They meet the leader Dr. Varno (John Hoyt) and his lieutenant Willard (Dennis Patrick), who take them on a tour of the “android” factory – robot workers who all look like Coneheads. Many stage-magic tricks are employed throughout this movie, to avoid having to use special effects, like an unbroken take of an android’s head being removed, or a teleportation device where the person disappears from a device exactly like a magic trick and appears somewhere else. Like all the science fiction movies of its day, TIME TRAVERLERS spends inordinate amounts of time didactically man-splaining “scientific” processes, with everyone standing around facing the fourth wall. But the movie does deserve kudos for its progressive ideas. First and foremost, the Humans are planning to travel to Alpha Centauri, identifying one of that star system’s planets as habitable. Did Irwin Allen steal this destination system for his 1965 LOST IN SPACE journey? Or was there a synergy in the 60s to hope that our nearest star, 4 light years away, would harbor Earth-like worlds? Carol: “He’s a human!” Oh, snap! Let’s face it, in that cold intolerant racist climate of 1964, it’s probably the warmest that Peter Strudwick has ever been treated. Willard is initially painted as a “villain” (and he raises his voice a little too shrilly) for wanting our scientists booted off the ship, but Varno and Willard try to help the time travelers reconstruct their time portal to at least return to their own time. Another very sane resolution to what might have devolved to a basic Hero vs. Villain trope. In a film rife with surprisingly progressive ideas, it surprises us then that it bows to that age-old convention of future societies consisting of Mutants and Humans at odds with each other. But who am I to talk in 2017? Our very existence proves TIME TRAVELERS correct. We are those filmmakers’ future – and there is, in fact, a race of mutants trying to kill the normally-developed humans, and there is, in fact, a dwindling number of intelligent humans trying to beat back the brain-dead. It’s called Dumbo Donald’s America. Writers: Ib Melchior, David L. Hewitt. Starring: Preston Foster, Philip Carey, Merry Anders, John Hoyt, Dennis Patrick, Joan Woodbury, Delores Wells, Steve Franken, Berry Kroeger, Peter Strudwick.